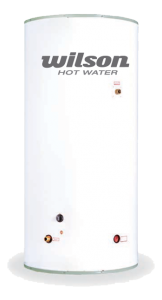 The Wilson “D” Series Dairy Hot Water Heater is available with or without attached header tank. If installed with a separate header tank, the maximum head pressure which is measured from the base of the storage unit to the top of the open vent pipe, must not exceed 6 metres. Both models are available in a variety of sizes and all are fitted with main and booster elements. The booster element is used to restore heat lost between the morning and evening milking and can either be turned on and off manually or controlled by a time switch (Check with your electrical contractor). Element sizes are based on an 8-hour heating cycle, but can be varied on request to suit supply authorities. The Wilson Dairy Hot Water Heater is fitted with a sacrificial anode to assist in combating the effects of aggressive water supplies around the heating zone. It is important the anode is regularly checked and replaced before it is eroded. Tip to Toe anodes are available upon request where more protection is required.